Every so often, an “art of” book comes along and makes me want to revisit the film itself and watch solely for the designs. Such is the case with a release in which the film’s director, Neill Blomkamp, specifically states he set out to explore the visual aspects of his story more than the sociological implications, a surprising notion considering the picture’s central theme. As we learn in the book, when he originally proposed the film Blomkamp put together 50-60 images he created on his computer and set them against the screenplay, creating a kind of graphic novel for investors and his actors. On the strength of these images—not to mention the strength of his first film, District 9—he garnered himself a $100 million budget and signed stars Matt Damon and Jodie Foster. 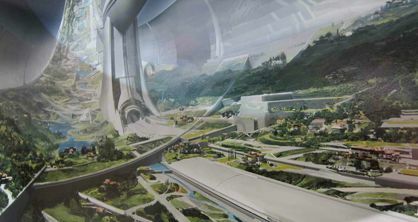 Set in the year 2154, the setup involves a space station called “Elysium” that orbits Earth and houses only the privileged who can afford to live there, while below on the planet’s surface is a ravaged Third World suffering from overpopulation, famine, and disease. An industrial accident leaves lowly factory worker Max (Damon) with just five days to live, and so he embarks on a mission to get passed strict anti-immigration enforcement and be cured in one of Elysium’s instant-cure stations. Armed with a hydraulic exoskeleton, Max faces Elysium’s ruthless Secretary of Defense (Foster) and her black ops agent Kruger (Sharlto Copley). The resulting film has been widely criticized for its paper thin political commentary, yet praised for Blomkamp’s visual style. Elysium: The Art of the Film is a testament to what works about the film. Available now from Titan Books in both a standard and a Limited Edition, the contains full page images showcasing the level of detail Blomkamp, production designer Phil Ivey, the team at Weta Workshop, and even legendary concept artist Syd Mead (Aliens, Blade Runner, and TRON). Each release contains more than 164 pages of full color concept art, drawings, paintings, movie stills, and informative text by author Mark Salisbury. The Limited Edition features a black slipcase with an image of Elysium on one side the ruined Earth on the other, a signature plate signed by Blomkamp, and a print by Mead. Inside the book is the story of Elysium both on and offscreen. In interviews with the cast and crew, but mostly Blomkamp, Salisbury follows the film from inception to execution, detailing the director’s origins for the film’s diptych world and how he set out to create it. “Blomkamp’s more interested in making muscular slice of popular cinema than preachy parables,” Salisbury writes. We can see this in fascinating detail he incorporates into the Los Angeles favela and its population rich with tattoos, futuristic logos, and policing robots. One of the most charming details from the film is Max’s “parole officer”—an automated, prerecorded sentry with no personality resembling a character of the McDonald’s variety. “Essentially I’m making fun of the First World,” Blomkamp remarks, which may be why Foster’s character seems almost cartoonishly and inexplicably evil—a point that, for me anyway, was a frustrating quality about Elysium. And yet, taking the picture as a bloody satire, something more like Total Recall than District 9, the director’s vision becomes clearer. Throughout the book, there’s a sense that Blomkamp was simply having fun creating these diametrically opposed worlds and filling them with fascinating details. Every artist’s rendering of robots, vehicles, hardware, weaponry, and futurist architecture has an almost cartoonish inspiration which will only help the somewhat disappointed viewer appreciate the film on an entirely different level. In fact, Elysium: The Art of the Film may be essential reading to readjust one’s expectations of Elysium from a District 9-level sociological allegory to the living comic book it proves to be.